Most Episcopalians and Americans know the United States’ history of slavery, and how Union and Confederate soldiers fought a bloody civil war opposing and defending it. But lesser known is the horrific story that preceded slaves’ journey to the New World; a journey that carried them from Africa to plantations and cities in the Americas and the Caribbean. From Accra, Ghana’s capital, the pilgrims flew north to Tamale and boarded a bus that took them further north to the Upper East Region, where they spent a morning walking the paths of Pikoro Slave Camp, the same paths walked by an estimated 500,000 enslaved people between 1704 and 1805. Newly captured slaves from Mali and Burkina Faso were brought to the camp where they were chained to trees, where they ate one meal a day from bowls carved into rock, and where the process of stripping them of their humanity commenced. 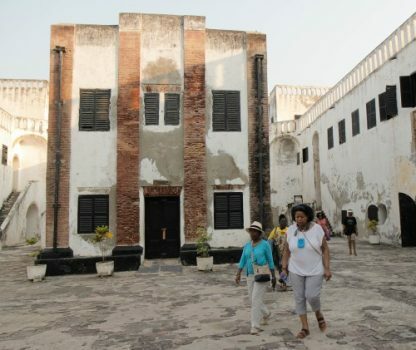 Slaves were marched from Pikoro 500 miles south to one of 50 castles on Africa’s west coast, 39 of them in Ghana, where they were held in dungeons, standing and sleeping in their own excrement, before their captors loaded them onto ships bound for the New World. The pilgrims traced that journey, as well, flying back to Accra and boarding a bus bound for the coast.